Katie Holmes' Broadway play "All My Sons" finally opened last night -- and although Tom was at the first night of previews, he didn't attend. Celebs in attendance included Patricia Clarkson, Barbara Walters and Isabella Rossellini. The 1947 Arthur Miller play is based on a true story of a woman learning a secret about her father during WWII. The play is about businessman Joe Keller -- played by veteran actor John Lithgow. "All My Sons" producer Eric Falkenstein said the play is "ultra-relevant" because of the Iraq War. He also praised Holmes, saying of her celeb status, "She handles it so well. The other cast members handle it so well." 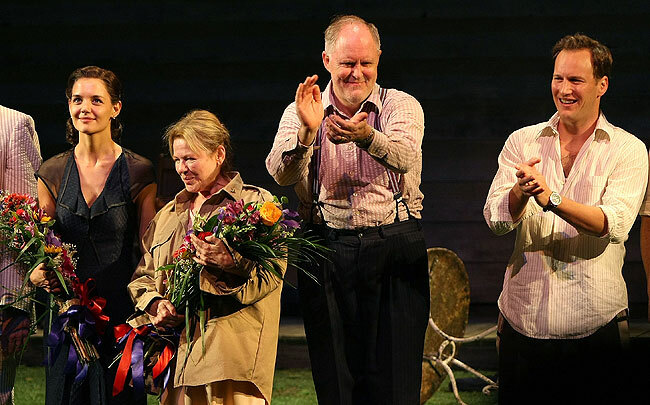 "All My Sons" was the highest-grossing play on Broadway in its first full week of previews -- earning $684,002.